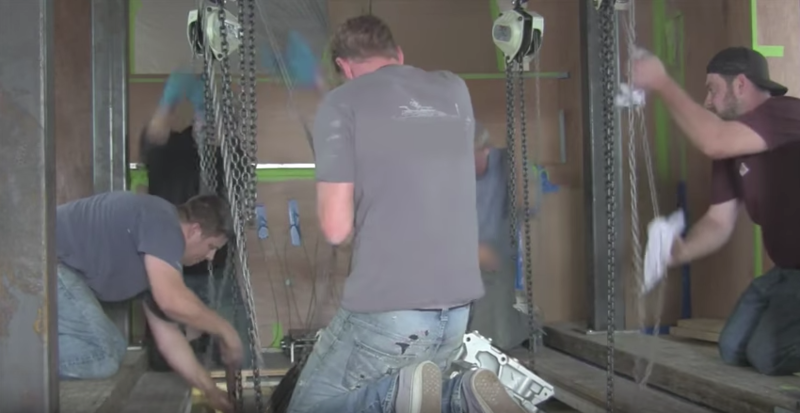 In this screenshot from the video posted below, the technicians are lifting the engine through a hole in the sole, while being careful to maintain an equal weight balance among the chain hoists. Recently the crew at Front Street Shipyard in Belfast, Maine, was faced with a challenge. How do you remove a damaged V-8 engine from a 135’ (41.1m) motoryacht without cutting into the hull? To further complicate matters, they also had to be careful not to damage a marble floor located directly above. To get the job done they relied on the ingenuity of Ken Priest, a veteran engineer who devised a unique trolley system to tow it aft and up—carefully. This system is described in the article, “The Extraction,” by our senior editor Paul Lazarus, who documented the extensive planning required for such a delicate yet weighty operation. Watch the engine removal take place in the 5-minute video below. To learn more, read “The Extraction” by Paul Lazarus in our August/September issue (Professional BoatBuilder No. 168).